Perhaps the simplest but counterintuitive observations are that ORC systems often fail due to lower than normal cooling temperatures or a sudden transition to lower cooling temperatures - the reasons are outlined below. Control strategies and sensible starting sequences can resolve many issues. Relatively simple hardware and procedural changes can resolve others. Some of these issues are outlined on this page - contact Simon for more details. A common problem in small scale ORC systems is under-loading of the expander - this results in high mass flow, high expander speed and low evaporation pressure, often without being able to reach design expander inlet temperatures, or having excessive superheat. 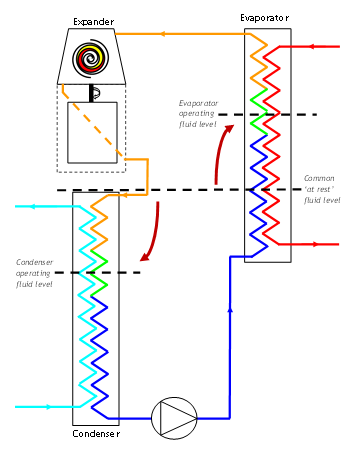 The mistake can be compounded by fundamental misunderstanding of the role of the Working Fluid Pump - its primary function is to supply a sufficient flow of working fluid to maintain the correct fluid level in the evaporator and to do so it must overcome the evaporator pressure - it does not set the evaporator pressure per se. The evaporation conditions are primarily controlled by expander loading to create the &apos;back pressure&apos; against which fluid evaporates. There is a clear relationship between the evaporating condition and expander mechanical conditions, which in turn have a direct relationship with the electrical conditions in the generator; shaft torque is proportional to pressure and torque is proportional to current. In parallel, expander speed is proportional to working fluid flow rate, and voltage is proportional to shaft speed (PM Generator). Power follows through in the same way; Pressure x Flow => Torque x Speed => Current x Voltage. A &apos;hill climbing&apos; algorithm which seeks the maximum power output is most likely to succeed - this approach is common for most PV and small wind generators inverters; speed and torque are varied to seek the maximum power output for any input conditions. Although a theoretical loading point could be calculated for any given heat input, losses tend to be proportional to pressure due to leakage past the expansion and other factors such as inlet temperature affecting mechanical expansion and superheat affecting oil quality which can all contribute to a dynamic loading condition which may change over time with wear. Approaches which pre-determine a loading proportional to either voltage or speed are likely to be sub-optimal much of the time unless the heat input and cooling conditions are relatively constant, but even then such approaches are likely to be sub-optimal as the expander wears over time so that leakage around the expansion becomes more prevalent. Although less common now, induction generators are a particular case where control is constrained to small speed increases above the synchronous speed unless inverter control is present, in which case a PM generator would be a more sensible approach as greater conversion efficiency and better control can be achieved. Most practical small-scale ORC circuits are lubricated with miscible oil which separates from the working fluid in the evaporator and is carried along the heat exchanger and pipes to the expander due to vapour velocity. To be an effective lubricant, the oil must be sufficiently &apos;dry&apos; at expander inlet conditions - free of working fluid. 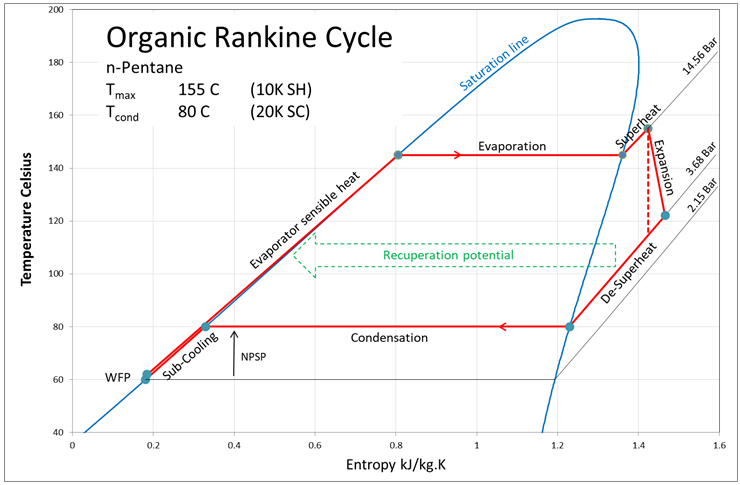 This requires perhaps more superheat than is required thermodynamically - most ORC working fluids will gain superheat during expansion (&apos;dry&apos; fluids) so the minimum superheat feasible at inlet conditions is thermodynamically preferable. 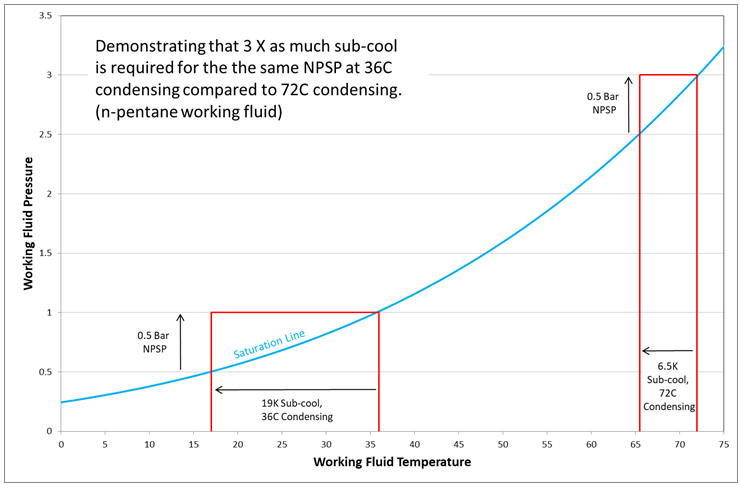 However, typically 5 to 10K of superheat is required to attain oil quality, which also gives some operational range for controls to respond to changing heat input - see TS chart for a typical n-Pentane ORC with 10K superheat, showing the &apos;dry&apos; characteristic which results in an increasing superheat throughout the expansion. Secondary control is of the working fluid pump to ensure the correct fluid flow is maintained so that the evaporator can supply the sensible heat to the incoming working fluid liquid, the latent heat for evaporation and the sensible heat to the vapour to maintain the required expander inlet superheat. The only caveat is that the working fluid pump must also maintain sufficient Net Positive Suction Pressure (NPSP) to avoid cavitation (see below) which in some circumstances may require a lower fluid flow rate and consequently a higher superheat than would be optimal for the expander. One of the challenges of successful small-scale ORC circuits is finding suitable working fluid pumps (WFP). Compared to many applications, the fluid condition entering the pump is close to saturation, or should be as close to saturation as feasible without causing cavitation to attain the maximum performance from the circuit; any proportion of the available cooling used to provide sub-cool for the working fluid will result in higher condensing pressure and poorer performance. To achieve sub-cooling, either part of the condenser heat exchanger is regarded as a sub-cooling region or a separate sub-cool heat exchanger is required. For most practical circuits, the level of fluid in the condenser (the condensing point) determines the sub-cool; higher the fluid level, greater the sub-cool. Although many ORC circuits are controlled for constant superheat, in circuits without receivers (refrigerant reservoir), the level of fluid in the evaporator and condenser are closely linked, so therefore are the superheat and sub-cool; they increase or decrease in parallel. The actual fluid level can be determined by the rate of pumping. 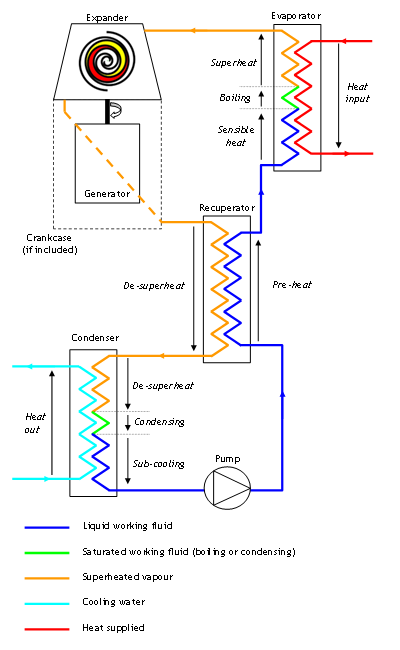 If the circuit is correctly charged, then controlling the fluid level in the condenser will also control the superheat, so a control strategy of controlling the sub-cool according to the current conditions should maintain a suitable superheat, provided a lower limit is set for sub-cool. Provided there is sufficient superheat (see above), the working fluid pump can therefore be controlled for sub-cool without measuring the superheat. This has the advantage of making preservation of the NPSP for the WFP the primary goal whilst using low temperature and low pressure sensors, which are likely to give cost savings and provide greater accuracy than sensing at high pressure and temperature for superheat control. Perhaps more important, if some fluid is lost over time, then NPSP is maintained so protecting the WFP and the superheat increases which will reduce performance, but also ensures &apos;dry&apos; oil is supplied to the expander. As the saturation pressure of all working fluids increases at an increasing rate with temperature, the sub-cool as a proportion of the available cooling will decrease with increasing temperature; i.e. you achieve the same NPSP for a smaller sub-cool as the cooling source gets warmer. This can be a useful way of recovering some of the lost performance due to increasing temperature of the cooling source, such as a domestic heating system. It may also be worth considering the required NPSP as a function of the fluid pumping rate; the requirement for NPSP increases with increasing pumping rate as the fluid velocity has to increase, so conversely, where a low pumping rate is required (to gain sub-cool) this may be partially compensated by a smaller NPSP being required. Following on from the last comment, the lower the temperature of the cooling source the higher the sub-cool needs to be, and therefore the higher the superheat. This suggests that at low temperatures, particularly when starting, it is necessary to sacrifice performance to maintain sufficient NPSP for the pump. A particular problem may also be a sudden drop in the cooling circuit temperature as may happen when a zone valve opens in a heating system for example, such that the condensing pressure drops suddenly and exposes warmer fluid entering the pump to lose sub-cool. This can be exacerbated by the length and thermal mass of the circuit between the WFP and the condenser heat exchanger and the mass of the WFP body. Control systems can be devised to cope with such problems. A corollary of the above is that fluids need to be chosen for both the heat source and the heat sink available. 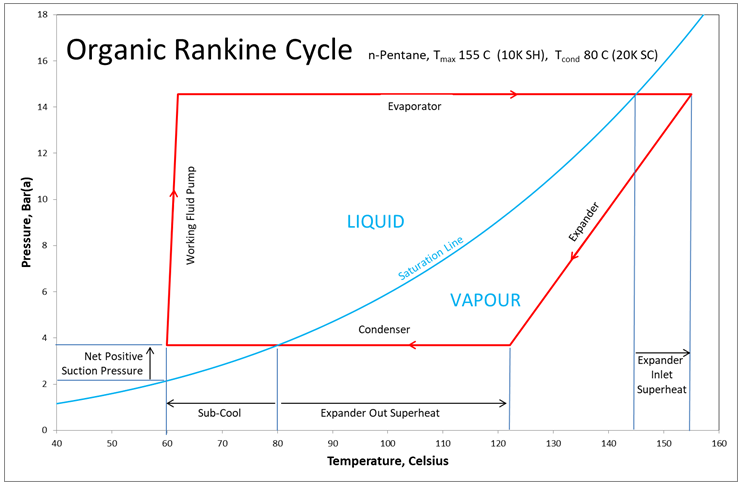 Rejecting heat at low temperature may appear to be advantageous in terms of achieving the greatest temperature difference for thermodynamic advantage, but a higher pressure fluid will be required to have realistic sub-cool requirements and may then limit the evaporation temperature due to pressure limitations of a practical circuit. A different working fluid may be required for effective operation in a low temperature heating system (flow < 45C) than a high temperature heating system (flow ~80C). Provided you have a good quality charge, the fluid in an ORC circuit prior to starting will be in a saturated state. Any attempt to rotate the WFP in this condition will result in cavitation which damages the pump. This suggests that a quantity of working fluid needs to be present in the evaporator before the pump is first rotated so that it can evaporate and create a vapour pressure which then provides a NPSP to the cold fluid in the pump. See diagram for fluid level implication in a simple circuit without recuperation. A further implication is that either the heat presented to the evaporator must be able to be controlled, or excess heat not taken by the evaporator during starting can bypass the ORC circuit - see thermosiphon below. 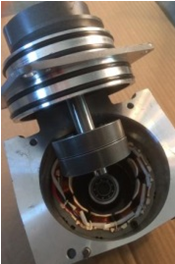 Generally, starting the ORC circuit presents some of the most difficult challenges if lasting damage is to be avoided through cavitation in the working fluid pump and through oil starvation in the expander. A strategy of starting off slowly with maximum sub-cool and superheat, after the cooling circuit has reached at least a warm condition, then decreasing the sub-cool to operational levels, is most likely to preserve the life and performance of the ORC circuit. Additional control strategies are recommended to cope with changing heat input and cooling, particularly coping with rapidly falling cooling return temperatures. It is well known to refrigeration and heat-pump manufacturers that poor vacuum and/or poor working fluid quality will reduce performance through non-condensable gasses collecting at the condenser. The same is true for ORC circuits, only the issue is more important as the condenser is on the low pressure side so non-condensable gasses will occupy a greater volume of the circuit and raise the condensing pressure by &apos;blanking&apos; heat exchanger surface area and due to partial pressures of the gasses at the condensing point. The opportunities for non-condensable gas to either be left in the circuit through poor vacuum or to enter the circuit through difficulties in charging with working fluids which have a sub-atmospheric saturation pressure at room temperature are particular problems in ORC. The physical ORC circuit is effectively divided in two (high and low pressure sides) by the working fluid pump and the expander which make achieving a good vacuum throughout the circuit difficult. It may be preferable to have charge ports on both sides of the circuit so that vacuum can be applied to both sides, particularly where positive displacement expanders are used. The expander and pump may require occasional slow rotation during vacuum to expose pockets of gas to the rest of the circuit for removal. Most refrigeration charging equipment is designed for high pressure working fluids where a small leak to atmosphere at the end of charging when the filling hose is disconnected from the valve is acceptable. However, charging with such equipment is likely to introduce air when the charge valve is disconnected for low pressure fluids typically used in ORC circuits. To overcome this equipment has to be specifically designed for ORC charging and/or the whole circuit and the working fluid need to be sufficiently warm to have a pressure greater than atmospheric during charging. By way of an example, n-pentane boils at approximately 36 C at standard atmospheric pressure, so the circuit and fluid would need to be warmer than this to use standard refrigeration charging equipment, say 40C. As flammable or toxic working fluids are likely to be stored outside, the refrigerant charge will have to be warmed before getting to the charge equipment. 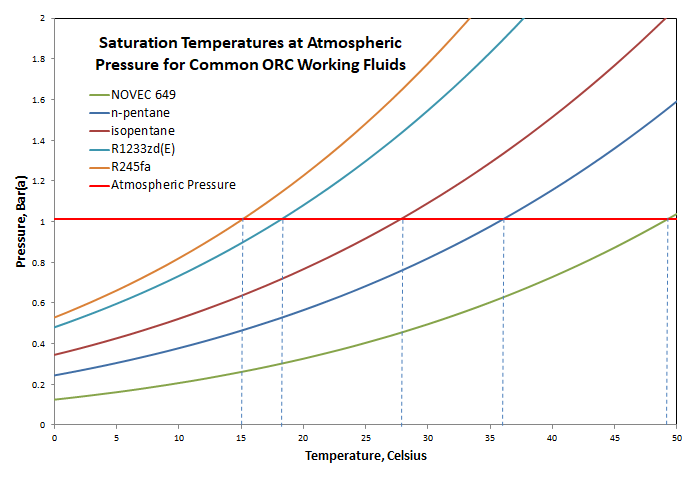 Even popular ORC fluids like R245fa (1Bar ~15C) may well cause problems as the working fluid may be far cooler than the charging environment if stored outside. In addition to air remaining in the circuit and ingress during charging, the other potential source of non-condensable gas is the working fluid itself. Particularly with hydrocarbon working fluids, they may be sold at several different purity grades as fuels, blowing agents, general solvents and reagents. Some grades may only be 95&percnt; pure, with possible contaminants including shorter chain hydrocarbons which readily become non-condensable gasses in the circuit and other isomers of the chosen hydrocarbon in addition to water and other chemical contaminants. Only the purest fluids should be used in an ORC circuit despite the higher price. in semi-hermetic components which may be damaged by the regular transition from pressure to vacuum and vice versa. O-ring seal designs are often specified for occasional vacuum (during charging) but not usually for regular pressure reversal; the design should not allow the seal to slide in its retaining slot which may cause fatigue damage over time - see diagram with (exaggerated) distortion. 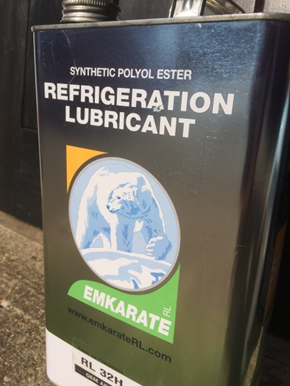 As in refrigeration, some oils are particularly hygroscopic such as Polyol Ester Oil (POE). Particular attention needs to be paid to components which are assembled with oil and could be exposed to humid air. Components containing oil which are pre-assembled and stored ready for circuit construction need to be either held under vacuum or under pressure with a &apos;clean&apos; gas. Breaking of the seal with subsequent ingress or loss of air or gas when the seal is removed during assembly proves that oil has not been exposed to moisture during storage. Like a refrigeration circuit, a small-scale ORC circuit would normally be sealed for life. This means that any wear particles will remain in the system. 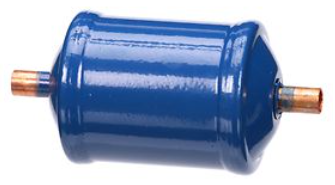 Damage can be limited by choice of seal materials and by ensuring sufficient oil is available at all times in the expander, particularly during starting. It may also be possible to choose materials such as graphite filled plastics for components that may wear in the pump and expander, so that wear particles are less likely to cause damage elsewhere - for example in the tip-seals of scroll expanders. However, wear particles are best filtered out, providing they do not cause significant pressure drops in filters. 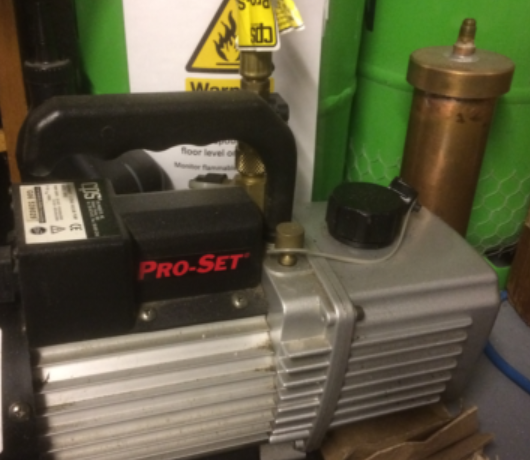 The only sensible location for a filter is on the delivery side of the working fluid pump where pressure drop can be compensated with least loss of performance. Filters placed before the pump are completely ruled out as the pressure drop across the filter will reduce the Net Positive Suction Pressure for the pump, leading to cavitation damage and complete failure of the pump as wear particles increase the pressure drop over time. Refrigeration liquid-line filter-driers may be appropriate on the discharge side of the pump, but only if the pressure drop can be shown to remain within the pump parameters over the ORC circuit design life as wear particles accumulate. Lubricated small-scale ORC systems are often seen as &apos;reverse refrigeration&apos; machines and the expander may be based on a modified refrigeration compressor. However, in a refrigeration or heat-pump system (reverse Rankine cycle), designers often try to concentrate oil in the compressor by bleeding oil from the high-pressure discharge port to the low-pressure region or sump. By concentrating oil around the compressor, the amount of oil carried through the circuit is reduced, which is beneficial in the condenser as oil coating the inner surfaces in the vapour region reduces the heat transfer required to cool and condense the working fluid, so requiring larger heat exchangers. In ORC circuits, oil cannot easily be concentrated around the expander as the direction of travel of the working fluid is towards the low-pressure side. Therefore all the oil has to be carried around the circuit, but does naturally travel towards the expander bearings on the low-pressure side. The disadvantage is that oil will coat the evaporator superheat region and condenser (and/or recuperator) de-superheat region, requiring larger surface areas to achieve the necessary heat exchange. Having all the oil pass through the working fluid pump in solution with the working fluid is an advantage as this improves the viscosity and lubricity of the fluid in the pump. As oil is always travelling around the circuit, simple rules of thumb concerning the volume of oil to volume of working fluid used in refrigeration are likely to considerably underestimate the amount of oil required. Having a high proportion of oil in the circuit can be seen as a &apos;parasitic&apos; factor as not only does the oil reduce the heat exchange in vapour phases, but it is also perceived to carry heat through the expander without doing useful work. However, this traditional view may be flawed as the highly turbulent passage through the expander will create a large surface area for heat exchange between the oil and vapour, so heat may be supplied to the expansion from the oil - this may be an interesting area of future study! Absorption/desorption effects are also worthy of further study. As most oils are readily miscible with working fluids and may absorb/desorb working fluid in the vapour phases of the circuit, the presence of oil makes it necessary to have superheat at the expander inlet so that the oil is sufficiently &apos;dried&apos; of working fluid to have the viscosity and lubricity required for the expander to operate. The need for superheat can be used as method for controlling the fluid flow rate by controlling the working fluid pump speed for a superheat set-point, although there are alternative control strategies which may protect the working fluid pump NPSP more effectively. A particular problem occurs during starting where vapour condenses onto the cold expander surfaces and effectively &apos;dry-cleans&apos; oil from the expander - gentle heating at high superheat and no load are required to return the expander to a lubricated state before the superheat can be reduced, the pressure increases and the expander goes to load. Starting sequences that motor the expander when cold may do considerable damage as oil will be &apos;washed out&apos; when the expander is cooler than the working fluid saturation temperature. Most, if not all lubricated expander types should self-start when sufficient oil is present to form a seal and when sufficient differential pressure is present. Although compressors can become &apos;liquid locked&apos; due to condensates and oil accumulation, the same cannot occur in most expander types. Expanders based on modified commercial HVAC compressors may have starting problems due to the high thermal mass of the hermetic crankcase and motor in the sump below the expander. This can present as a significant heat sink during starting so that working fluid pools in the crankcase, diluting oil and starving the rest of the circuit of working fluid. The only sensible strategy to deal with this problem, other than not using such equipment, is to maintain a high sump temperature with electric band heaters prior to starting, but this may represent a significant parasitic loss if the start time is not predictable so that heating has to be applied at all times. The significant thermal mass of the sump can also be an issue with rapidly changing cooling circuit temperatures during operation. As oil must travel around the circuit particular attention needs to be paid to circuit layout and pipe sizing to ensure sufficient vapour velocity to draw oil through the vapour phase of the system and to drain the expander to the condenser. In particular the connection from the evaporator to the expander should be as short and &apos;clean&apos; as possible to help get oil to the expander as soon as possible after the starting phase when oil gets &apos;washed out&apos; of the expander. In some circuits optimum performance may be reduced due to the need to have sufficient vapour velocity for oil mobility which may cause some pressure drops. Pressure drop may be most significant on the low pressure side of the circuit as the density of the vapour is typically 1/5th or less that on the high pressure side so pipes need to be 2 ~ 2.5 time the internal diameter for the same vapour velocity, which is not always possible. Lubrication requirements limit the operational temperature range and the way in which heat is introduced to the circuit. Direct heating from high temperature sources such as gas or oil burners is likely to cause localised overheating of oil, particularly in the superheat region where oil forms a thin coating on the inner surfaces of the heat exchanger. Applying heat indirectly through a primary circuit is more likely to succeed as the primary circuit fluid temperature can be controlled to avoid overheating the oil. A two-phase circuit such as a steam thermosiphon is most likely to succeed as much of the heat transfer from the primary circuit to the ORC circuit can be latent heat on both sides of the heat exchanger, so avoiding the need for excessive heat in the primary circuit and consequential problems of oil damage. 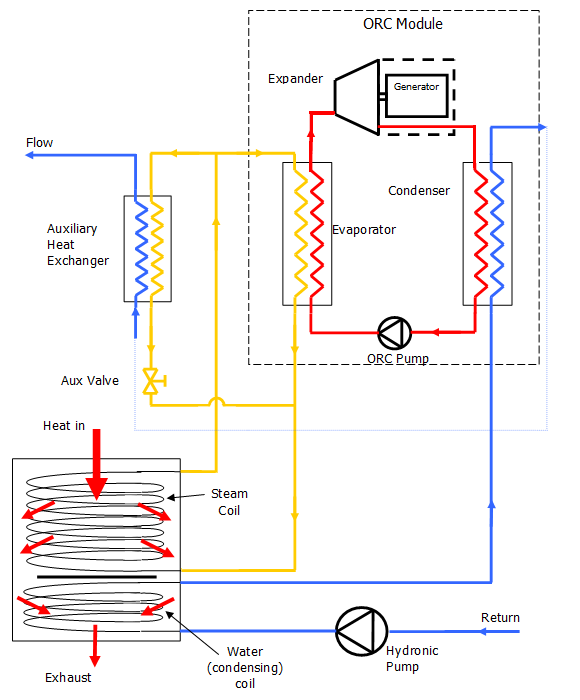 The steam thermosiphon circuit supplying heat to simple ORC circuit shown to the right, includes an auxiliary heat exchanger to share or bypass heat with the ORC circuit and also shows a condensing coil for the central heating water. This type of thermosiphon is described in patent EP2076717B1, "A closed cycle heat transfer device and method", Benstead and Redford, Priority 12-10-06. I hope the design and control issues outlined above help your development project. For help with these issues and fundamental design choices for components, circuit layout, fluid choices, control, safety and other aspects of ORC circuit design, please contact Simon through the contact details given on this website. These expander simulations can be downloaded as Java files (need Java runtime) by clicking on the above animations, or you can visit my software examples page where you can download them and others as Java project files for the Netbeans environment. The expander simulation software allows you to modify the scroll size, number of wraps, etc. The software to show a real scroll orbit motion allows you to view the side or top orientation and to change speed and direction to understand the motion.